Laura Griffith has only had custody of her half-sister, Darcy Weber, for a few months. Their mother and Darcy's father are both deceased. The worst thing Darcy could imagine was to leave New York for Missouri, but she considers her older sister Laura a little too conservative and leaves. Laura knows that she's going to need more than just prayer to track down Darcy and turns to the Phoenix private investigation firm. The investigator assigned to her case is James "Dev" Devlin, a former ATF agent. They are both concerned because a large snow storm is hitting their area, and Darcy may be without shelter. Dev's investigation quickly shows that Darcy may have been at the local bus station but it is closed due to the weather. Dev and Laura begin to search local shelters, hoping that someone may have seen Darcy. While Dev and Laura are bonding over the search for Darcy, Darcy is being held captive by a shelter worker that showed her some kindness and offered his home and shower facilities for the runaway teen. Both Darcy and Laura rethink their relationship during Darcy's absence, and realize that they both have to be more considerate of each other. Darcy realizes that Laura's faith isn't such a bad thing and that her "rules" aren't as far-fetched as she originally thought. Laura comes to realize that she really cares for her sister and is willing to compromise more on her rules in the future . . . if she ever finds Darcy and is able to bring her home. Will Dev and his partners be able to locate Darcy before it's too late? I found Trapped to be a quick inspirational, romantic suspense read. Laura and Darcy are siblings that have very little in common other than their mother. Laura is much older than Darcy and is rather staid and overly-conservative to Darcy's mind. Darcy is an out-of-control teenager with authority issues to Laura's mind. They learn that appearances can be deceiving. They also realize that they have both been a little too quick to judge one another and look forward to being able to start anew. The clean-romance angle between Laura and Dev adds just enough spice to the story to keep it interesting. 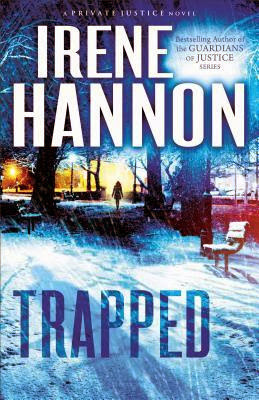 There are quite a few twists and turns to Trapped and Ms. Hannon does an admirable job of keeping the reader in suspense until the very end. If you enjoy romantic suspense or inspirational reads then you'll definitely want to add Trapped to your reading list.